Heather's Perfect Posts: Amazing Optical Illusions, Images that will Mash Your Brain! an experience of seeming to see something that does not exist or that is other than it appears. What is your favorite illusion image? What do you notice about each optical illusion? Tell us about it! Optical illusions are very interesting. There are different types of optical illusions. The first four in your post are called motion illusion in which a static image appears to be moving due to the pattern or color. There is a famous optical illusion called The Spinning Dancer. Some people see the figure as spinning clockwise and some people see it spinning counter-clockwise. Additionally, some may see the figure suddenly spin in the opposite direction. I like the last picture the most because it appears to be real 3D to me. Yes, to me, it seems like the Spinning Dancer is purposely doing that. When we stared at it, we both saw it turn in the same time. Sometimes, the Spinning Dancer doesn't turn until you take your eyes off of it! What are some other famous optical illusions that you know of? If you scroll to the bottom of the page, you will see a multitude of hyperlinks. Click on them, and you will see all of the famous optical illusions. On the last photo, the picture is a sketch, so it almost looks like a toy ship model. What makes is look three dimensional to you? How would you describe the other photos? My favorite optical illusion is the first one produced by Zach Lynch. For me, it looks like the circles are spinning both counterclockwise and clockwise. There is a optical illusion in my room, and it is on my closed blinds. It looks like the individual blinds are moving, and it only works in the morning. Are there any illusions in your home? I also like the optical illusion that is by Zach Lynch. To me, it looks like the little circles are animated to move around, but your eyes are making you think that. As you may know, your brain controls your eyes, and when you look at that, you mind thinks, "Well... It is spinning." When you look at it, that is what your mind thinks, so it will look like it's spinning. This comment was published in the afternoon, so unfortunately, I can't look at my closed blinds and see if they are shaking. Tomorrow, when I wake up, I will try to remember to look at the blinds closely. No, I haven't seen one optical illusion at my home. I don't really have anything at my house that tricks you. In the post, I forgot to add that it it also called a visual illusion. Did you know that fact? I know some famous optical illusions that are posted on Wikipedia, but can you figure them out? Yes, I do like optical illusions. My favorite optical illusion is the ship, and it is hard for me to take my eyes off it. I liked how it is 3-D. I can't tell if the spring is moving. Is it or not? I do agree it does hurt your eyes after a wile, just like TV. Did you know that the flashlight app has optical illusions? Which is your favorite optical illusion? The spring that you are talking about is not moving. All of these photos are pictures, not gifs. A gif is an animation that has a series of pictures to create a mini video. The spring is supposed to make it look like it is curving like a spring. Just because I used photos, it doesn't mean that all optical illusions are pictures. Some are gifs, while the others are pictures. If you click on the hyperlink, you will see that the famous Spinning Dancer is a gif. Which do you prefer, a picture of an animation? Yes, I have looked at the flashlight and I have seen the optical illusion. My favorite optical illusion is the wheel because it seems like it moves the most. Don't you agree? Your illusions look like they are moving. My favorite illusion is the last one because it looks like it is 3-D to me. I noticed that they are not moving, but it looks like it is. The spinning lady makes me dizzy. Is she moving or not? What illusion do you like? Optical illusions sometimes give me a headache, but I still like looking at the magic that they bring to our eyes. Do you agree? The spinning lady is actually moving. I posted pictures that don't move, but the one on Wikipedia is actually moving! My favorite optical illusion is the wheel image by Zach Lynch. I like it because it seems to always be on the go! :-D The one that you favor is one one of my top three favorites. First goes the wheel, then the one that looks like the sound waves of a radio, and finally the one that you like. The picture is made on different papers, and together, they look three-dimensional. What are your thee favorites? I adore optical illusions! I looked up illusions on Youtube, and I saw amazing, unbelievable illusions! My favorite illusion is the second one. It's my favorite because it has so many colors and so many zigzags, that it looks like it's moving! How did you find these pictures? What made you choose them? Rocky, did you pick out an illusion? 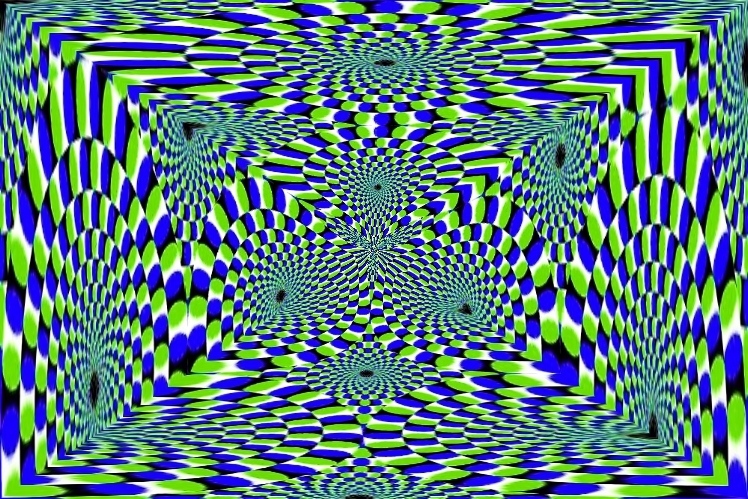 I noticed that your third picture doesn't seem to be moving. :-( Is it suppose to? Does it move when you look at it? Do you have to look at it for a while? Wow! What a perfect post! When you say your title is named "Heather's Perfect Posts," you MEAN IT. Oh my gosh those pictures make me blinded! Peter's favorite optical illusion is the one posted by Zack Lynch. Ali's favorite optical illusion is also by Zach Lynch. Optical illusions do not give us headaches. We do NOT agree, but we do agree about the magic they bring to our eyes. Do you know any other optical illusions? I do agree that the wheel moves the most, and it is hard to tell if some are optical illusions or not. Sadly I can't use the flashlight, :-( but I can do some cool things. For example, I can make a flag with it. I just noticed if you walk away a bit from the first image, it is different. Those are some crazy optical illusion! 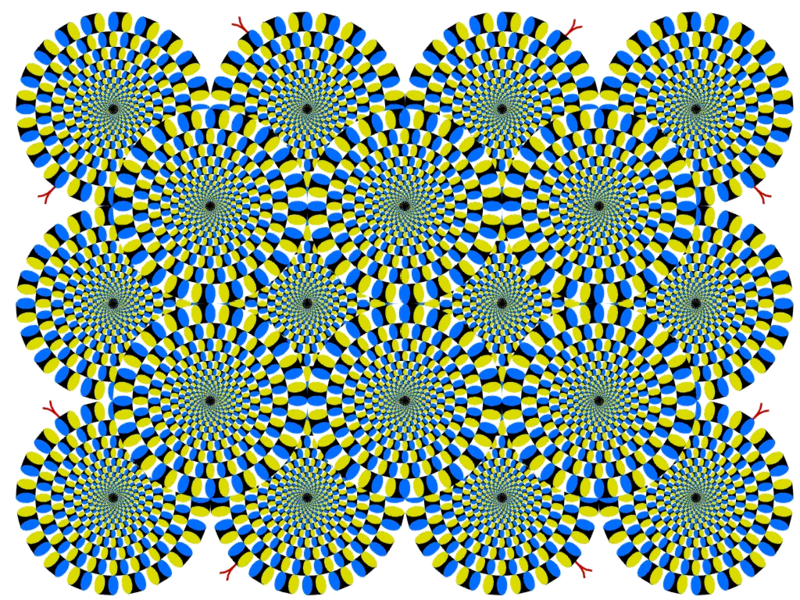 When you look at them, it looks like they are moving, but your eyes are playing tricks on you. Do you also feel like your getting hypothesized? Alec's top two illusions are the spinning circles and the pirate ship. Nate's top two favorite illusions are the same. We both like optical illusions. The spinning circles look like they spin both ways, but they really are not spinning at all. The spring like illusion looks like its turning down. The ship looks so realistic it looks like it's a model. What ways do the circles look like there spinning to you? I prefer the pirate ship illusion to the circles graphic. The spinning circles fooled my eyes so well I felt dizzy. No thanks! Sometimes optical illusions occur in nature. Has anyone ever seen a mirage on a hot, sunny day? A Story to Accompany "Georgie Says, 'Ha!'"